kc bob: What is Love? Barbara posted this quote the other day and it got me to thinking that it is a pretty good description of love. Do you have a good definition? Wow, choked up a bit I am. That so nails it, I have no words. Some people mistake a "mutual benefit society" for love. But "love" is not the same thing as "use"; it is its opposite. Love donates rather than leases. I haven't experienced mad, passionate and extraordinary love since I was 17. Were I not thought to be immature, I would have been deemed certifiable. Love is the desire to do good to to others. Hmmmm.... I've chewed on this quote (the 1st one, above) for a few days now, and still find myself disagreeing with it. So often love is calm and quiet and safe--things that don't fit neatly into a package of "mad, passionate and extraordinary"--and yet I have not found that quiet, low-key kind of love to be a waste of time or mediocre. I've lived a life being "loved" in passionate and extraordinary ways, and in the end, the passion was only so much noise that kept me from being as quiet as I needed to be to hear the other (poisonous) things in that relationship that non-stop passion covered up. 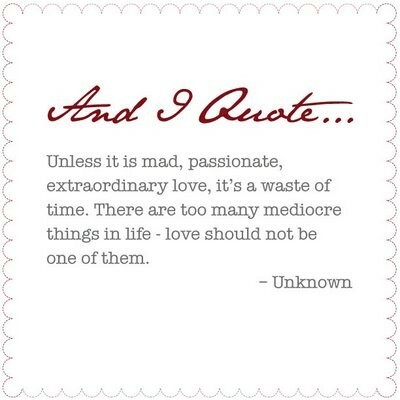 I'm not saying that I believe the opposite of this quote is true--that passion is bad or wrong in love. Just that focusing on passion and the extraordinariness of love as a necessary and in fact, primary, ingredient really misses the boat, I believe. For me, incredible healing has come by being in a relationship which is quiet and safe. The quietness makes space for me to hear love being spoken to my heart, instead of just being wowed by amazing, superhuman acts and demonstrations/promises of perfect or super love. I think love sits and looks honestly at the hard realities of life that often mitigate against passion and finds that, in spite of all that, two people can draw close together, being there for each other, sharing in each other's joys and sorrows and caring deeply (and gratefully) for each other. The moments of happy passionate love felt and expressed come and go, but to me the extraordinary thing about love is how its lived out in daily, ordinary ways. God is Love; but love is not God. I should note, my comment was regarding "Love is an unconditional commitment to an imperfect person." I don't think mad, passionate, extraordinary love needs to be expressed madly, passionately, or extraordinarily, meaning I don't think it's talking about an outward sign of love. It could very easily be quite, safe and those other things. "quite" should have been "quiet"